Big news coming to us from across the pond, as we’ve learned that British scientists have developed a revolutionary blood test capable of detecting any type of cancer. This test will help doctors take more precise steps with patients who present with specific symptoms that could be caused by cancer or some other disease. That’ll also mean thousands of people who’ll be spared unnecessary invasive procedures and biopsies. So far, the blood test has been used with patients that had melanoma, lung cancer, and colon cancer. Blood was taken from each and the test was able to diagnose cancer and pre-cancerous conditions with a significant level of accuracy. The research team, who’ve been developing the test at the University of Bradford, are already testing it’s wide range of applications. There are still plenty of cancers that are very difficult to diagnose, but this simple test could be a significant asset. How Does this Simple Test Work? The blood test is called Lymphocyte Genome Sensitivity (LGS), and it works by assessing the level of damage that has been caused to the DNA of the white blood cells. The cells are exposed to varying levels of ultraviolet light (UVA), which we know can cause irreparable damage to our DNA. The Bradford team claims that there is a distinct difference between the damage they’ll witness in people who are healthy and those who are cancerous. 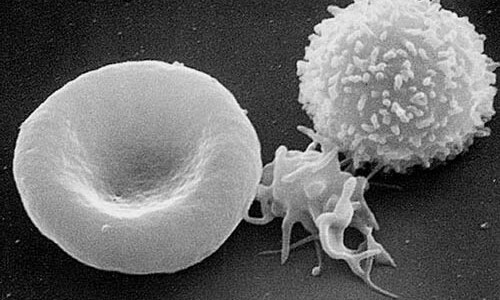 Our white blood cells are a crucial aspect of the human body’s ability to protect itself from foreign invaders. The data was compiled after the researchers examined 208 blood samples (94 of which were taken from healthy volunteers at the University). The team got the rest of their blood samples from patients who’d been referred to specialist clinics within Bradford Royal Infirmary before they were diagnosed or treated. “These are early results completed on three different types of cancer and we accept that more research needs to be done; but these results so far are remarkable,” said Anderson. These early results are certainly impressive, even if the initial test cohort was pretty small overall. The LGS is now being tested in a full-size clinical trial at the Bradford Royal Infirmary with selected patients who are at risk for colorectal cancer.